Before finding this vintage Austria-Hungary map in the 1911 Encyclopedia, I could only tell you two things about this country – it was in Europe and the assassination of their Archduke played a pivotal role in World War I. At the time of publication, the Austro-Hungarian Monarchy was a two-state country that had only existed for 43 years. In 1901, there were over 45 million inhabitants of the monarchy – about 1/8 of the total population of Europe. Bosnia and Herzegovina had become part of the dominions of the monarchy in 1909. At the height of it’s power, Austria-Hungary was the second largest country in Europe; Russia was the only one larger. They had the 4th largest machine building industry in the world and the 3rd largest manufacturer and exporter of electric home appliances, electric industrial appliances and power generation apparatuses. Even though part of the same country, the states of Austria and Hungary were completely independent of each other. They had a common monarch who carried the title Emperor of Austria and Apostolic King of Hungary. After the dust settled from World War I, the Austro-Hungarian Monarchy collapsed. With pressure from the United States and other countries, the country was divided. The states of Austria and Hungary were formed along with the State of Slevenes, Croats and Serbs. Italy, Germany, Czechoslovakia, Poland, and Romania also gained lands from the former monarchy. Obviously, a whole lot happened between it’s founding in 1867 and it’s demise in 1920. This vintage Austria-Hungary map shows many of the places that factored into World War I. It would be helpful to students studying that time period. And, the wonderfully large scan would be excellent for craft projects. I’ve shared a smaller version of the map here. 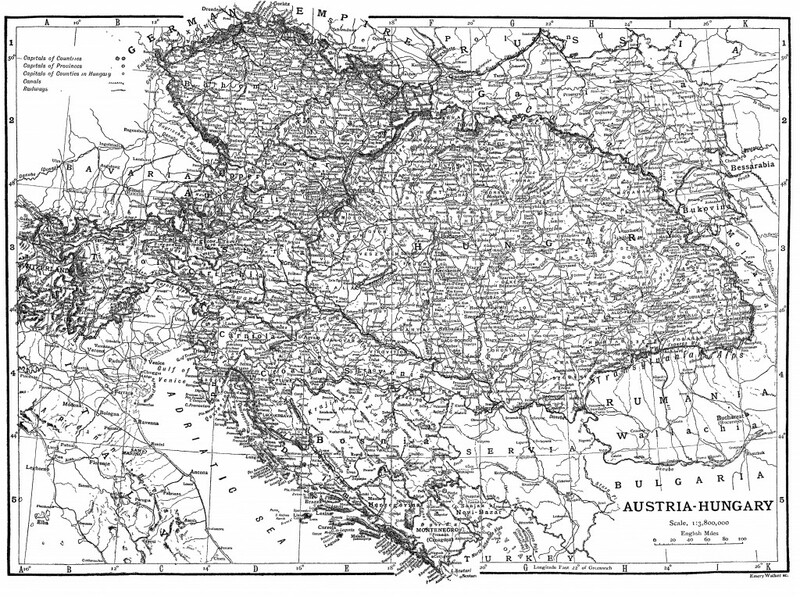 If you want a large vintage Austria-Hungary map, simply click on the image below to view it.